Souns/Peace Corps – Seeds Sprouting! Souns Approach to Learning Phonetic Sounds without Souns symbols. This is the Souns program through the words of one Peace Corps volunteer as he is helping teachers around him build a more literate world for children in South Africa. He is introducing the Souns program across environments. Children will read in South Africa thanks to the collaborative effort of the Peace Corps and Rotary Districts 9400/6900. Children often have a difficulty with reading because they learn words through rote memory of high frequency words. These children have difficulties when coming across unfamiliar words. If children are exposed to individual phonetic sounds at an early age, such as the cretche age, they will be a more balanced reader, able to read with fluency and decode. Learners are introduced to the first four sounds “o m s t.” Groups can be from 1-8 learners. The preferred method is to be seated on the floor. The teacher has the four sounds in a bag and pulls out one sound (the plastic representation of the sound) and says “o.” The learners will repeat “o.” Then the teacher goes from learner to learner, saying “o” and allowing each learner to touch and hold the sound. After all learners have touched and said the “o” sound, lay the sound on the ground and repeat with “m” and then the rest of the four sounds. After all 4 sounds have been introduced and laid on the ground in from of the learners, repeat the sound and give one to each child. Now that each child is holding a sound, ask, “Can I have the “o”?” The child with “o” will hand you the “o” and you will place the sound back in the bag. Say “thank you” and ask for the “m” and so on until all the letters are in the bag. Give each child a “high five” and say “thank you”. Each session should last less than 15 minutes and done only once a day. The sessions should focus on being fun and not dispensing of knowledge. A teacher should never say “no.” If a learner says a sound incorrectly, such as “o” when the sound is “m”, say, “This is “m,”” and continue with the session. If a learner points at a sound, such as “m”, and says it incorrectly, say, “This is “m,”” and allow the child a chance to say it correctly. If they continue to struggle, say “Good job,” make a note, and continue with the session. It is important that each sound is not drawn out too much. If the learners are learning “t”, make sure the learners say “t” once and not “t, t, t, t”. If they are learning “s,” make sure they say “sss” and not “sss, sss, sss”. This is because the child will soon be reading and they need to learn how the sound sounds naturally when read. Never add vowel sounds to the end of consonant sounds. If teaching “s”, it is never “sa” or “se” or “si”, it is “sss” and only “sss”. This will help the child break words down and be able to learn other languages that do not follow the Bantu word formation of every syllable ending in a vowel. “sa”, “se”, “si”, “so”, “su” is a helpful approach for reading intervention and can be done at a later stage, but it is not beneficial when a child is first learning phonetic sounds. When showing the learners a sound, be sure to display the sound in a way that it is proper for the child viewing it. This way they do not confuse the sound. This is especially imperative when doing b, d, p, and q. Working with the plastic representations can be substituted by drawing with a stick in the dirt. 1. The LEAP learner will take their group and a stick to their designated spot in the yard. In this case, they will sit down in a line with students beside the teacher. Greet each student, ask a simple question, and say something to get them excited, such as, “Ready to have some fun? !” Be sure the learners can each see the patch of dirt in front of them and the LEAP learner. 2. They will go through the introduction process, as mentioned above, but instead of displaying a plastic representation of the sound, the teacher will slowly write the sound in the dirt in front of the learners. Form the letter slowly, so the child is able to watch how the letter is formed. 3. The LEAP will point to the representation of the sound drawn in the dirt and say it to each learner. 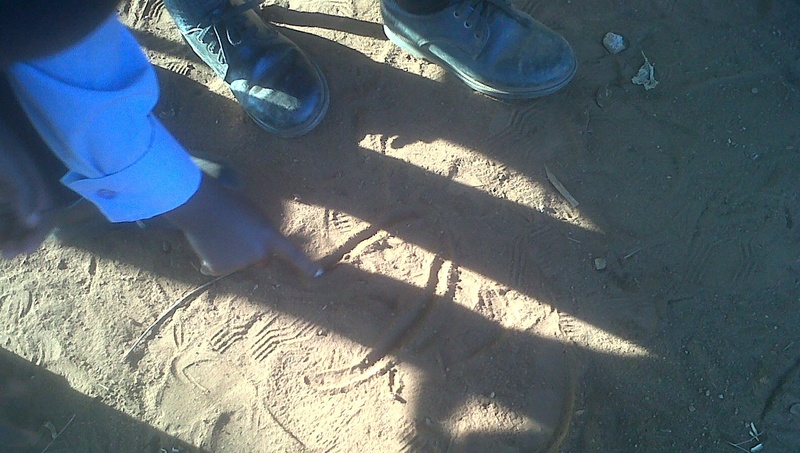 After saying it to one learner, allow the learner to attempt drawing the sound in the dirt also. As noted under “Notes on the Approach,” be sure to not say “no”. Just allow the learner to try their best and move along, keeping their excitement high. 4. By the end, you should have 4 sounds drawn in the dirt, facing the learners. Go through each sound saying, “Can someone touch the “o”?” and then erase after choosing one child to touch it and then move to the “m” and so on until all sounds are erased. 5. Give each learner a sign of congratulation such as a “high five” and end the session. Please visit souns.org and read more about souns. Then go to souns Resources on the left hand column. Once on the souns Resources page, click on the souns Tracking Sheet and start one tracking sheet for each cretche learner that is kept track of by their LEAP learner. 1. Get a marker or pen and lightly write the sound on the hand of each learner. Be sure to write the same letter on the same part of the palm. This will allow you to write four sounds (2 on top of each hand and two on the bottom of each hand). Be sure to sit behind the learner and slowly write the sound, allowing them to see how the sound is formed. After this, you can ask them to match their sound to their friends’ same sound. It is a fun way for them to take their learning home and show their parents what they learned that day at school. 2. As a review, draw each sound apart from each other in the yard. Say a sound and have the group run to each sound, look at it, and shout it out. This is a good way to get them excited about the sound and can even be done individually as a way of review. Be sure to demonstrate first. 3. Get large representations of sounds already learned and spread them out in your learning area. Ask learners to find the different sounds on the paper and/or have them show you the sounds. This will be a pivotal step in their understanding of how sounds connect to the world they live in. 4. Once learners attain the first 8 sounds, it is a good time to create some words. From the first 9 sounds, in Tshivenda, you can say the words mme, ita, sita, sema, and many more that I don’t know. Say the word normally and then say it slowly, making sure the learner hears each individual sound. Ask the learner what that word means and if you have a physical representation of the word, show it to the learners. Allow the learner then to do say the word normally and then slowly. Say it again together, pointing out the first sound, and then you or, if able, the child writes the sound in the dirt. Do the same for the next sound. When the entire word is written, sound out each sound and then say the word again normally. Congratulate the learner and tell them they built a word. This will be a big step for the learner and should be used only with sounds mastered. This is an easy concept that will be great for the LEAP learners to share with the cretche learners. It will be most beneficial when mixed with reading of stories, singing of songs, and playing of games. © 2012 by SounsⓇ All rights reserved. No part of this document may be reproduced or transmitted in any form or by any means, electronic, mechanical, photocopying, recording, or otherwise, without prior written permission of Souns. This entry was posted in Good Practice with Souns, Peace Corps, Rotary Projects, SounsAfrica and tagged letter-sounds, literacy, Peace Corps, phonics, RD6900, RD9400, reading, Rotary, Souns, South Africa. Bookmark the permalink. ← Birth To Three Institute in D.C.